He wore a scarlet coat, with ruffles on his sleeves, which soon became the prevailing fashion; and it is related of Dr. Nathan Jacques, the famous pedestrian, of West Newbury, that he paced all the way to Boston, in one day, to procure cloth for a coat like that of John Hancock, and returned with it under his arm, on foot. There was no such person. There was Dr. Nathan Jaques (1761-1818) of Ipswich. 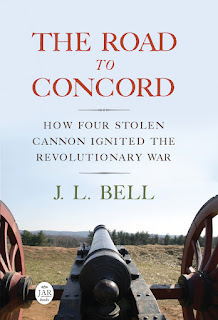 He served for six months in short-term military companies raised in Rowley in 1780 and 1781, the latter stint as a sergeant. In 1807 Dr. Jaques became Ipswich’s postmaster. I haven’t found any reference besides this anecdote to the doctor being a “famous pedestrian,” known—even locally—for walking long distances. Nor have I found how he trained as a physician. Dr. Jaques married for the first time in 1792. That was an occasion for a young gentleman to buy a particularly nice suit. Or he could have done so earlier as he set up his practice and thought about courting a wife. 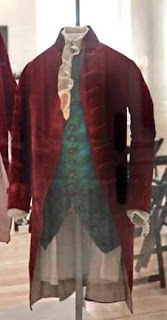 At this time, (June, 1782,) about noon, Hancock was dressed in a red velvet cap, within which was one of fine linen. The latter was turned up over the lower edge of the velvet one, two or three inches. He wore a blue damask gown, lined with silk; a white stock, a white satin embroidered waistcoat, black satin small-clothes, white silk stockings, and red morocco slippers. But Loring specifically suggests that a “scarlet coat,” most likely of red velvet, was what Dr. Jaques wanted to emulate. And the Old State House Museum owns a red silk velvet coat, shown above, which family tradition says Hancock wore at one of his gubernatorial inaugurations. This garment was recently reproduced by historical tailor Henry M. Cooke IV so the original could go into storage. Copying John Hancock’s red velvet coat thus has a long history in these parts.